1) When it comes to snuffing out cigars, senseless smoking bans and ridiculous tax hikes aren’t the only methods available to the government. Eminent domain – the power of bureaucrats to seize citizens’ private property – is another nasty tool, and it’s being abused in San Diego. 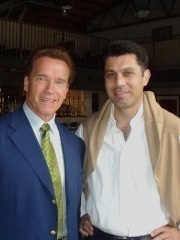 This week an appellate court ruled the city was justified in condemning the Gran Havana cigar lounge to make way for a Marriott hotel, and the judge even threw out a $9 million compensation for owner Ahmad Mesdaq (pictured at right with Governator Schwarzenegger). 2) As Hurricane Felix pounded Nicaragua on Tuesday we were keeping our fingers crossed. After all, Estelí is one of the most important cigar-producing cities in the world, and lord knows what effect a Category 5 storm would have on its inhabitants or the industry. Luckily, according to Cigar Aficionado, the hurricane’s impact was minimal in that area of the country. 3) Think tobacco taxes are a bad idea? (Well, duh.) This editorial in the Wall Street Journal does too. Read it so the next time some anti-tobacco busybody tries to convince you otherwise you’ll have all the facts to set them straight. 4) Around the Blogs: Stogie Review reviews the Rocky Patel Fusion. Cigar Jack tries the Arganese Ambassador. Keepers of the Flame lights up a Vega Fina. Stogie Fresh smokes a Tatuaje La Maravilla. Cigar Beat torches up a Montesino. Cigar Monkey smokes a Oliva Serie V.
5) Deal of the Week: This ten cigar “Black and Tan” Sampler from Tinderbox includes some fantastic cigars like the Tatuaje Conoju 2003, a CAO Sopranos Edition Associate and the Camacho Triple Maduro Torpedo. Those three smokes can easily run you over $30, but you get them plus seven other quality sticks for just under $50. Pick yours up here.